A consortium of seven academic colleges—Dental Medicine, Health Care Sciences, Medical Sciences, Nursing, Optometry, Osteopathic Medicine, and Pharmacy—have banded together to offer poster displays and oral presentations of their current cutting-edge research. In addition to the more than 130 oral and poster presentations, we are also inviting world renowned researchers to give keynote addresses. We anticipate over 2,000 students, faculty, and guests to be in attendance. Adding to the festivities will be a judging and presentation of awards for outstanding research. This event promises to be more than a day-long celebration of research and scholarly activities. It is also an opportunity for students and faculty from multiple disciplines to interact with each other and with the larger research community. 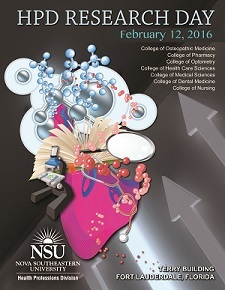 HPD Research Day is the premier, student-participated academic research event in Florida..